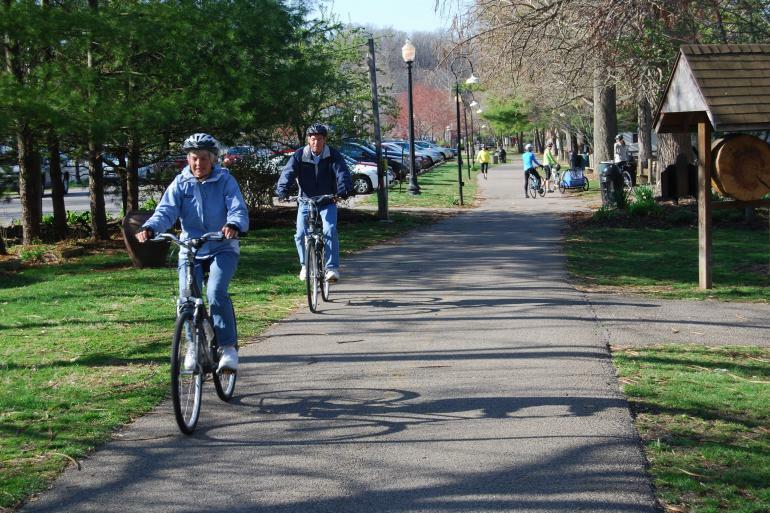 Tri-State Trails is aiming to encourage the public to get outdoors with the Opening Day on the Trails Challenge – a seven week series of hikes, group bike rides, and other events on trails and in parks throughout the Cincinnati region. The challenge starts with an event at Sawyer Point from 12pm to 5pm on Saturday, April 16, which is also Earth Day. The Opening Day on the Trails Challenge is part of a national kickoff by the Rails-to-Trail Conservancy to promote the spring outdoor season. Running from mid-April to early June, the challenge overlaps with National Bike Month in May. Information on the challenge can be found online at MeetMeOutdoors.com. Participants can register on the website, and sign up to receive email newsletters and social media alerts. A Trails Challenge Passport is also available for download. To participate, individuals and families attend group events, which are listed on a schedule included with the passport. Attendance at activities is logged on the passport, and those who attend at least one event are eligible to win a prize. Organizers say that the challenge will conclude with an award ceremony on National Trails Day on June 4 at the Purple People Bridge. Participants who complete the challenge will receive a Nalgene water bottle and other items. A raffle will also be held to award prizes, donated by local businesses and Cincy Red Bike, to registered participants. Tri-State Trails, a program of Green Umbrella, is the local host of the challenge, and is hoping it will encourage more people to get out and explore the region’s network of bike paths and trails. Wade Johnston, Regional Trails Coordinator for Tri-State Trails, sees the event as an opportunity to showcase not only the many multimodal trails in the Cincinnati region, but also the hiking and mountain biking trails. Tri-State Trails has been told by the Rails to Trails Conservancy that the Challenge in the Cincinnati region is the largest and longest program of any opening day trail event in the United States. Johnston told UrbanCincy that public support and usage of the region’s trail system is increasing, citing the Cincinnati Connects plan, and efforts to expand the Mill Creek Greenway, Ohio River Trail, and Wasson Way. The Opening Day on the Trails event is supported by a $25,000 grant from Interact for Health. While this is the first year for this event in Cincinnati, it is intended to be an annual event in the future. Green Umbrella’s Outdoor Event Series will continue through the summer with the Kids Outdoor Adventure Expo on July 22 at Winton Woods Harbor, and the Great Outdoor Weekend on September 24 and 25 at a variety of locations around the Cincinnati area.